After posting a 12.5 percent decline in 2015, Berkshire Hathaway’s common stock entered the new year only modestly above the company’s repurchase threshold of 120 percent of book value. As a result, many commentators have been speculating on the possibility of repurchases in the near future. Due to recent market volatility, many investors are seeking “safe havens” in the short run and have noticed that Berkshire has limited downside before reaching the repurchase threshold. It is not uncommon to see references to a “floor” for Berkshire’s stock price roughly corresponding to 120 percent of book value. Based on the last reported book value figure of $151,083 as of September 30, 2015, the repurchase threshold currently stands at $181,300 which is slightly more than 8 percent below Berkshire’s closing price on January 6. 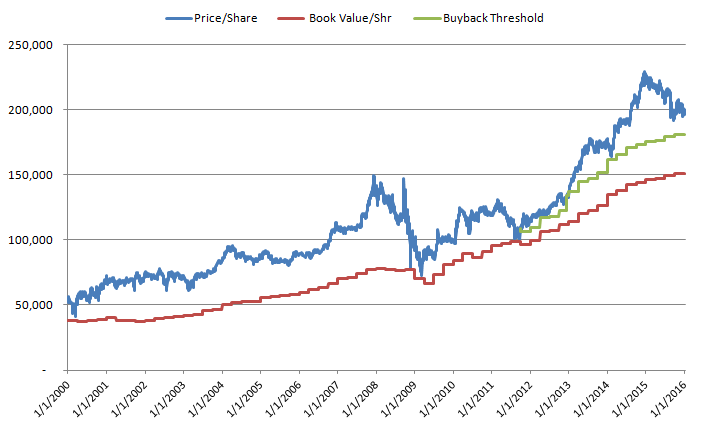 The exhibit below displays Berkshire’s Class A share price and book value per share since 2000 along with Berkshire’s “buyback threshold” since Warren Buffett introduced the first such threshold in September 2011. The threshold was originally set at 110 percent of book value and was subsequently raised to 120 percent of book value in December 2012. It is unusual for a public company to telegraph its intentions in this manner. However, Mr. Buffett feels strongly that if the company repurchases stock, departing shareholders should be fully aware of the possibility that the company may be buying and that management views the shares as undervalued. Anyone looking at this chart might be forgiven for thinking that the repurchase threshold represents a “floor”. Indeed, the stock has rarely traded below the prevailing repurchase level since it was first introduced in September 2011. However, there are a number of reasons to be very cautious when thinking about the repurchase threshold. It appears that many investors are focusing on part of Mr. Buffett’s statement rather than looking at it in full. He clearly states that Berkshire will only repurchase shares well below intrinsic value and that he will likely repurchase aggressively if that opportunity arises. However, it is also clear that repurchases will not occur simply to support the stock price and that Berkshire could very well pursue opportunities other than repurchases in particularly weak markets. We make no attempt to predict stock prices in the short run and have no particular opinion regarding the possibility of a major bear market in the near term. However, it is worth pondering a scenario where stocks fall sharply in the near term and how that might impact Berkshire’s book value and propensity to repurchase shares. If the equity markets enter a severe bear market in 2016, perhaps falling 30 to 40 percent, Berkshire’s large holdings in publicly traded securities will almost certainly participate in the decline as well which will have a negative impact on reported book value. Additionally, Berkshire’s equity derivative investments will also show mark-to-market declines which will negatively impact book value in the short run. Exerting a pull in the opposite direction, it is almost certain that Berkshire would still report substantial operating earnings which would increase book value. Where will the dust settle? It is certainly possible that a declining stock market could result in Berkshire’s book value falling in any given quarter or even in a full year despite the effect of substantial operating earnings. Such a decline in book value would obviously reduce the repurchase threshold commensurately. Therefore, even if the repurchase level could be considered a “floor”, that floor could be moving downward in the short run. However, the situation is even more complex. If equity markets decline severely, that will present major opportunities for Mr. Buffett to deploy Berkshire’s cash. Not only will publicly traded equities be cheaper but the market for private businesses would probably soften as well. If the market decline is also accompanied by real or perceived systemic risks to the overall financial system, as was the case in 2008-2009, Mr. Buffett’s phone will be ringing off the hook with offers for unusual investment opportunities at attractive terms because Berkshire will have cash and the “Buffett stamp of approval” is worth a great deal in crisis conditions. Faced with a rich set of investment opportunities brought about by a market panic, there is no reason to believe that repurchasing Berkshire shares will be Mr. Buffett’s favored choice under such conditions. If Berkshire does indeed trade at or slightly below the threshold in a given quarter and it is revealed that Berkshire did not repurchase shares, or repurchased only a modest amount, all talk of a “floor” will likely disappear. As Mr. Buffett said in the 2011 annual report, he has no interest in repurchasing shares simply to “support” Berkshire’s stock price. Rather than viewing Berkshire’s repurchase threshold as a floor or as a short term buying signal, long term oriented investors should instead regard it as a long term buying signal. This is not merely because of the fact that Mr. Buffett plainly regards purchases at such a level to be a bargain, but because Berkshire demonstrably provides more intrinsic value at such a price than one must pay in exchange for shares. We last commented on Berkshire’s valuation in September 2014 when the shares were reaching record highs. The shares continued to advance up to the end of 2014 and have declined since that time. There are many methods that can be used to estimate Berkshire’s valuation but buying at a low price-to-book ratio has proven to be a reliable approach in the past. Through year-end 2014, Berkshire delivered annualized book value growth over the preceding ten years of 10.1 percent. This was a ten year period that included the tail end of a bull market, the most severe economic downturn since the Great Depression, and the subsequent recovery. Even if we assume a somewhat lower rate of book value growth over the next decade, such as 9 percent, Berkshire’s book value will likely be close to $350,000 per share by 2026. A number of valuation methods, such as the two-column approach, confirm that a price-to-book ratio of 150 percent is not unreasonable. This would imply a stock price of around $525,000 ten years from now representing somewhat more than 10 percent annualized returns if buying at the current stock price. This is quite attractive for a company with Berkshire’s overall risk profile and there is room for some upside beyond that. (Note that if Berkshire starts to pay dividends at some point over the decade, which seems more likely than not, total returns would be somewhat lower due to less internal compounding and, for some shareholders, tax consequences). The lesson is clear: Use Berkshire’s repurchase threshold as a long term buying signal, not as a short term signal. The threshold does not represent a short term floor and people buying the stock as a short term safe haven could very well be disappointed.